BARCELONA, Spain — For Roger Heredia, the battle for Catalan independence began generations ago. His great-grandfather fought and died in 1938 at the hands of forces loyal to Spain's Gen. Francisco Franco. Under Franco's dictatorship, from 1939 to 1975, Catalonia's distinct culture, language and separatist aspirations were suppressed. Heredia and other hard-line secessionists believe the mistreatment of Catalans continues to this day. "The transition from Franco to democracy was a farce — a lie," said Heredia, who is running as a separatist candidate in Thursday's Catalan elections with his ancestor in mind. Voters in the regional parliamentary election will have a choice between parties that seek an independent state, or at least more autonomy, and unionists that favor remaining within Spain. Polls show the two sides running neck and neck. The prospect of Catalan independence threatens the integrity of Spain and is sending jitters throughout Europe. E.U. leaders fear an independent Catalonia might encourage separatist movements elsewhere in the bloc. Voting appeared to be proceeding peacefully so far, in contrast to an Oct. 1 independence referendum that drew a violent response from Spanish policeand clashes at polling stations. "Political power is deciding how much money you have, how you spend that money, and what laws you pass"
Months of uncertainty have already had economic ramifications for the region, which accounts for roughly a fifth of Spain's economy. But analysts say the vote is unlikely to settle questions of independence. Potentially fractious coalition talks await separatists if they secure a parliamentary majority, with divisions over how to proceed. A win for the unionist parties would deal a significant blow to the independence movement, but likely not quash the separatists' aspirations. Declaring independence would be like "jumping into the vacuum," said Josep Borrell — an anti-independence Catalan, Spanish politician and former President of the European Parliament. Borrell said he identified as both Spanish and Catalan. Analysts said the independence struggle may have even served to strengthen Spanish nationalism, with gains anticipated for the anti-independence Citizens party. Separatists and those who seek more autonomy say they want to wrest control from the national government in Madrid. They argue the region contributes more to Madrid than it receives, and say it should have more fiscal autonomy and control over key infrastructure projects. "Political power is deciding how much money you have, how you spend that money, and what laws you pass," said Germà Bel, an economics professor at the University of Barcelona and former pro-independence member of the Catalan parliament. Spanish Prime Minister Mariano Rajoy called Thursday's elections in late October after Catalan leaders unilaterally declared independence — a move considered illegal by the national government in Madrid. Spain's constitution does not allow for regional self-determination. Over 90 percent of voters opted for secession in the October referendum, though only 43 percent of those eligible participated. 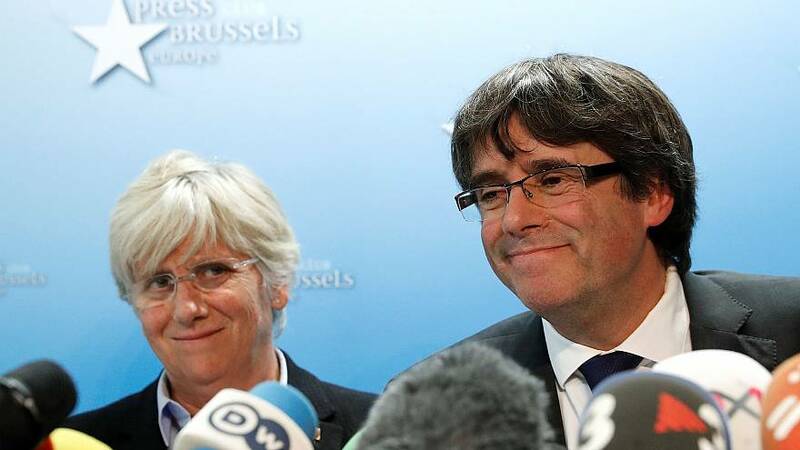 Following days of uncertainty, Carles Puigdemont, the former Catalan leader, declared independence on Oct. 27. Rajoy swiftly invoked never-before-used powers to dissolve Catalan's regional parliament and take direct control over the region. Arrest warrants were issued for up to 20 Catalan leaders. Puigdemont fled to Brussels, where he remains. In calling the most recent election, Rajoy hoped to stem the separatist tide. Madrid is betting that fallout from October's bungled independence declaration will draw unionist voters to the polls. The separatists hope a victory on Thursday will compel Spain to negotiate. It remains unclear whether Madrid will drop the charges in the event that the separatists win a parliamentary majority. Like many others throughout Spain, Borrell, the anti-independence Catalan, takes issue with comparisons between Franco's dictatorship and today's government in Madrid. Likening Madrid's treatment of separatists to time under Franco is "an insult to the history and memory of people who really suffered under Franco's dictatorship," he said. Catalan leaders had hoped for support from the European Union, but it has not been forthcoming. Several other E.U. member states, such as Italy and Belgium, are facing restive regional movements and fear Catalan independence might legitimize their aspirations. The Spanish government has indicated that it will not countenance another Catalan independence bid and that it stands ready to reassert direct control if challenged. "Anything the separatist groups try to do that could be interpreted as a push for independence will be very closely watched by the Spanish government," said Andrew Dowling, a lecturer on Catalan history and politics at Cardiff University. No matter the outcome of today's election, the debate over independence will likely persist. The vote "does not mean this finishes here — this has just begun," Heredia said. Richard Engel and Aggelos Petropoulos reported from Barcelona. Kennett Werner reported from London.